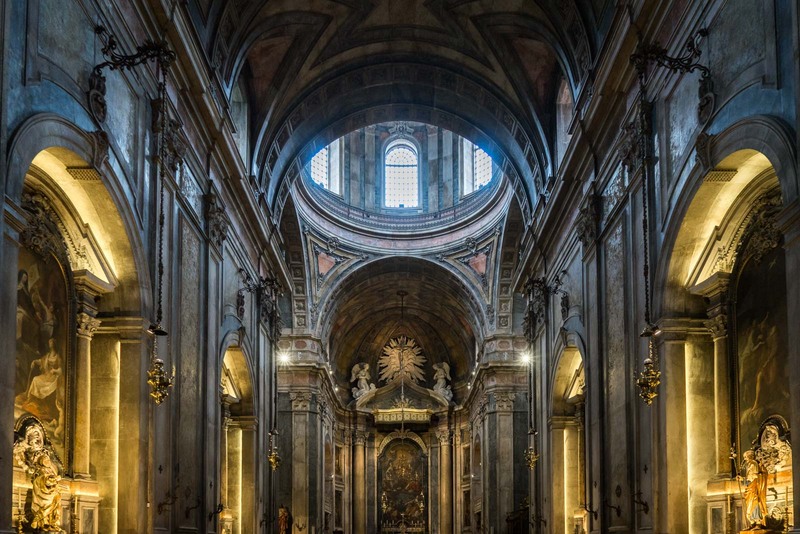 Lisbon’s churches are one of the best things to see in the city. Through their design and decoration, they tell the story of Portugal’s history over the centuries. From each viewpoint, you see their spires. In the public squares, they dominate. On the main roads, they command attention. In Lisbon, churches are an integral part of the city. They are still used by a large part of the local population; they form the foundations of many communities; and (as I discover) they are very useful for directions when you’re walking around. But for visitors, the great thing about the Lisbon churches is that they are sights in themselves. There are dozens of churches in central Lisbon (most Catholic), tracing the story of religion in a country where it defined an empire and still has a huge impact on daily life. Church and state may have been officially separated in the early 1900s but the Catholic hierarchy still wields a heavy influence. What I find interesting in the art of Lisbon’s churches is how the figures are portrayed in much more benevolent expressions than those in neighbouring Spain. I’m told that the reason saints are more often portrayed as calm and forgiving, rather than pained and judgemental, is because of rural traditions. The Portuguese, more than the Spanish or Italian, incorporate into their beliefs traditional and peaceful elements of folk spirituality that sit outside official Catholic doctrine. But, like most of this part of Europe, the interior decorations of Catholic churches demonstrate the importance in the structure of the religion. Elaborately-carved chapels, golden walls, enormous murals, intricate sculptures and vibrant stained-glass windows – it’s all here on display. If you’re visiting, I would suggest you spend some time to go into Lisbon’s churches. It’s quite easy to do and you’ll probably find yourself walking past many of them as you do some sightseeing around the city. Conveniently, many of them are also on the route of the Tram 28. 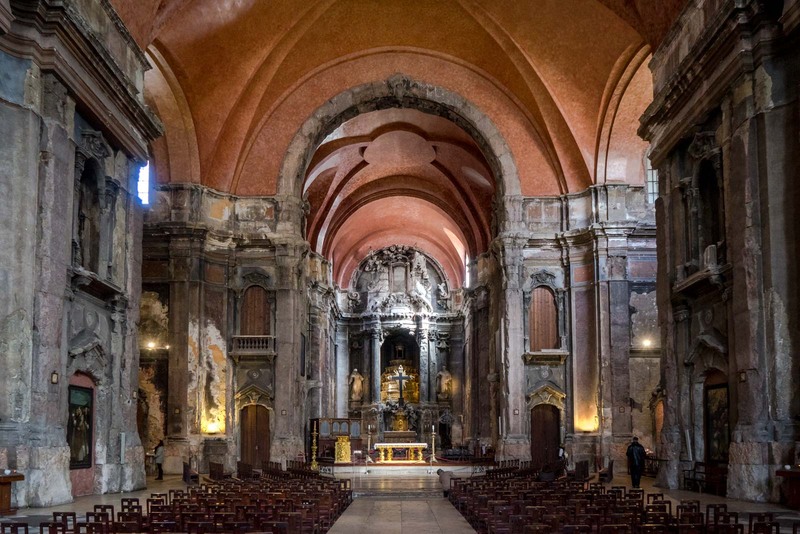 To give you a sense of Lisbon’s churches, have a look at the collection of 360 degree photos that I have put together for you below. Spin around and you’ll be able to feel what it’s like to stand inside each of them. 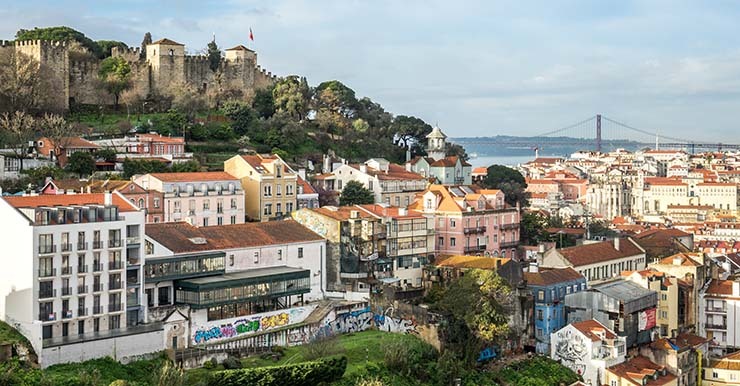 With these photos, go on a journey through centuries of religious art in Lisbon and Portugal. Lisbon Cathedral is often just called the Sé and is the most important Catholic church in the city. It’s also the oldest church in the city, having been built in 1147. It’s been modified over the years and now has a mixture of styles but it’s predominately Late Romanesque architecture. You’ll notice that the interiors are relatively bland and most of the stone inside is uncovered. Basílica da Estrela is one of the largest churches in Lisbon and has a giant rococo dome on top of it. The dome and the two bell towers on the facade are quite easy to spot from many of the city’s viewpoints. It was built from 1779 on orders from Queen Maria I and you’ll find her tomb inside. Behind her tomb is the entrance to a room that has a special baroque nativity scene with over 500 figurines. 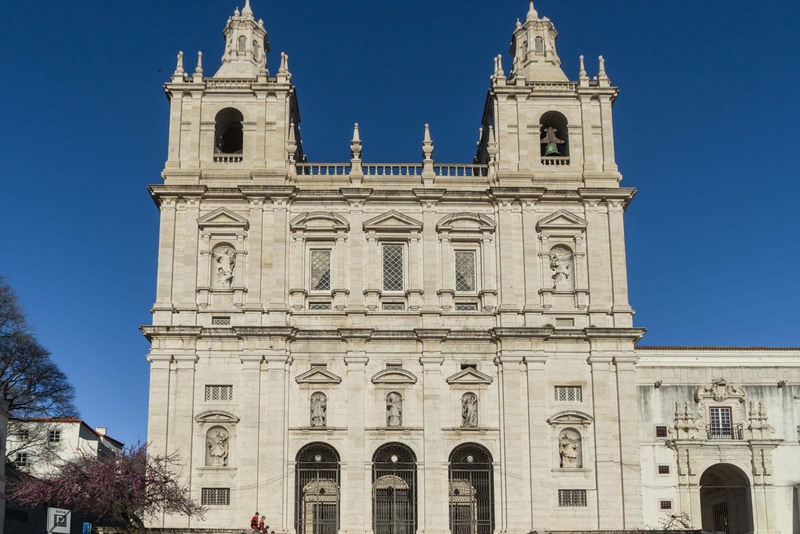 Although Igreja Santa Maria de Belém is part of the Jerónimos Monastery complex, I have listed it here because it actually has a separate entrance and is free to go into. Like the monastery, construction started in 1501 and it was designed to be a spiritual refuge for sailors and explorers before they set off on their journeys. There are a lot of things to see inside the church but make sure you don’t miss the tombs of Vasco da Gama and Luís de Camões. Igreja de São Roque is on one of the main streets in Bairro Alto and it’s easy to find. Construction started here in 1555 and it was one of the first Jesuit churches in the world. The most spectacular thing about the church is the interior, which is full of gold and marble. The chapels on either side each have their own special style of decoration but the highlight is the Chapel of St John the Baptist. I almost missed Igreja de Santa Catarina the first time because it doesn’t have an obviously-grand facade on this main street, but the interior is incredible. It’s decorated in the baroque style with lots of gold and there’s a beautiful stucco rococo ceiling. One of the most important elements is the monumental organ which is a masterpiece of gilded woodwork. The best reason to go to Igreja e Convento da Graça is for the Graça viewpoint at its entrance, but make sure you go inside as well. Although the original church was on this site since 1291, the new one in the baroque style was built after the 1755 earthquake. The chapels on either side are not overly gaudy but the detailed figures in them are quite beautiful. Make sure you go up into the area near the altar where a figure of Christ carrying a cross is kept – it’s used in Easter processions. Igreja de Santo António is right next to Lisbon Cathedral and it’s easy to see both of them at the same time. It’s quite a small church with simple decoration but it’s extremely important because it was built on the spot where Saint Anthony of Lisbon was born. You can go down into the crypt to see the exact spot of his birth but there is not too much to see there. Igreja do Menino Deus is often closed but I manage to find it open on a Wednesday morning. It was built by King João V in 1711 and is full of stunning artworks that he commissioned. The church is in the baroque style with carved and gilded woodwork in the chapels. You might think Igreja dos Anjos is quite new from the exterior, which is only a hundred years old. But it was built to house a much older interior that used to be in a church that was knocked down to build a road. The gilded woodwork is from the 1600s and some of the paintings are from the 1500s. It’s quite a small church that doesn’t get many visitors but there’s a lot of history on display. This is one of my favourite churches in Lisbon because of the atmosphere inside. 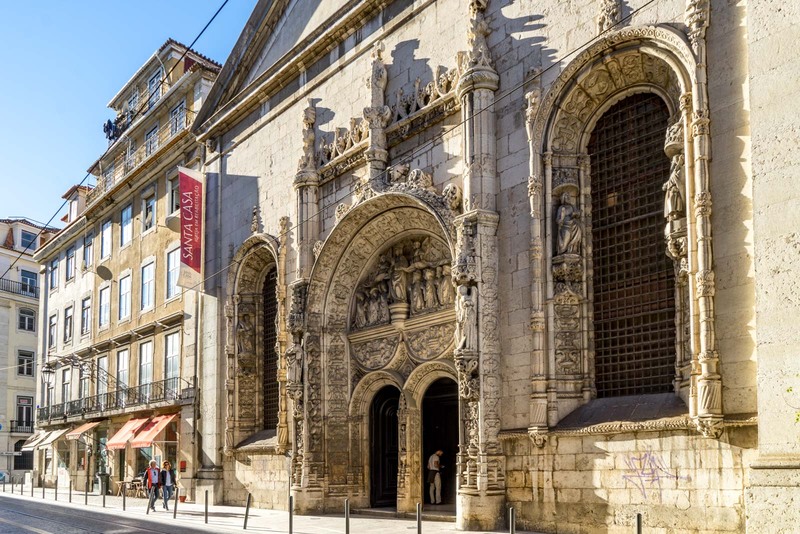 Igreja de São Domingos was first built in 1241 and was once the largest church in Lisbon. Inside, it looks damaged – and it is. Although it survived two major earthquakes, it was devastated by a fire in 1959. Although structural elements were restored, the effect of the fire was left on the columns and many of the walls. There are two significant things to know about Igreja Paroquial do Santíssimo Sacramento, which was built in the 17th century. The first is that it has beautiful ceiling paintings done in the 18th century. The second is that it’s the only church in Lisbon where mass is done in Latin. The ceremony might be a bit too heavy for you but pop in and see the ceiling. Although the interior of Igreja da Nossa Senhora da Conceição Velha is lovely, it’s really the facade of this church that makes it noteworthy. This portal in the Manueline style was built in 1496 and is the only part of the building that survived the 1755 earthquake. It includes figures of nobles and religious clerics and is similar to the carvings at Jerónimos Monastery. Igreja da Nossa Senhora da Encarnação is on the main square of Chiado and is one of the main landmarks of the district. Inside is an impressive sculpture of Our Lady of the Incarnation, done by famous Portuguese sculptor Machado de Castro. The other important element are the beautiful paintings on the ceiling. Of all the churches I’ve included in this list, Igreja do Santo Condestável is by far the newest one. It was opened in 1951 and is in a more suburban part of the city, just to the west of the Basílica da Estrela. I have recommended it because it shows the modern style of Portuguese churches – still grand and imposing but with less bright decoration. The highlight artistically is the stained-glass windows. If you take the Tram 28 route (either by carriage or walking), you will finish at Prazeres Cemetery. Inside the cemetery, you’ll find this small church, Capela do Cemitério dos Prazeres. I have recommended it particularly because it has an exhibition space on the upper level which is usually free to enter and has interesting temporary collections on a range of topics. The final church I am mentioning here is the only one that is not free – but it is included for free with a ticket to the Tile Museum. The Tile Museum is housed inside the old Madre de Deus Convent and this is the church attached to that. Built in the early 16th century, what makes it so spectacular is the tiled artwork along the walls of the church. If you have any other Lisbon churches you would like to recommend, please let me know in the comment section below.